United States, Mexico and Cuba collaborate on marine life issues. The Gulf of Mexico represents one massive, interconnected ecosystem bordered by three nations: the United States, Mexico and Cuba. It takes a little mathematical calisthenics to assess how big it is. From the tip of the Yucatán Peninsula to Cape Sable, Fla., the Gulf shoreline measures more than 3,500 miles — 357 of them in Texas — plus another 236 miles on the western end of the island of Cuba. Add in bays and other inland waters, and the total hits more than 16,000 miles of Gulf shore. Inside the perimeters of this giant bowl, the Gulf contains 643 quadrillion (15 zeroes) gallons of water. Complex currents carry that water through the Yucatán Strait between Mexico and Cuba. There, it circulates in several loops before exiting the Florida Strait (between Cuba and Florida) and becoming part of the Gulf Stream. This circulation connects the three countries in ways seen and unseen. A fish born on reefs south of Cuba may mature off the coast of Florida or Texas. Sea turtles migrate along the entire Gulf Coast; major migratory bird flyways crisscross its waters. 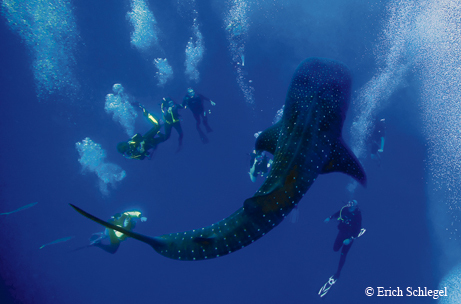 Whale sharks have been tracked across its length and breadth. Oil spilled off the coast of one country has made it to the shores of another. 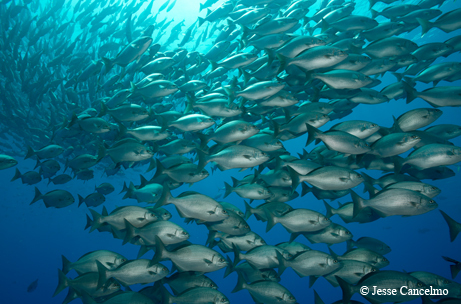 Large migratory species such as mackerel and tuna also move throughout Gulf waters, although scientists don’t yet know the exact paths they take. Sea turtles recently have been tracked moving along the entire Gulf coastline, and as research continues, Tunnell expects other Gulf-wide wandering species will be identified. Given this context, it makes little sense for any of the Gulf’s three nations to study or try to manage its resources alone. From its founding in 2000, the Harte Research Institute planned to involve research in all three countries, says Tunnell. Already cooperating with scientists in Mexico, he began making regular trips to Cuba in 2002. In 2007, 15 scientists each from the U.S. and Cuba met in Cancún to discuss how they could collaborate, coming up with a formal name for their efforts: the Trinational Initiative for Marine Science and Conservation in the Gulf of Mexico and Western Caribbean. Subsequent meetings took place in March and October 2009, those involving scientists from Mexico as well. The participants created a nearly 40-page plan of action outlining research and conservation priorities. The plan was honed at meetings in 2010 in Sarasota, Fla., and November 2013 in Corpus Christi (hosted by the Harte Institute). 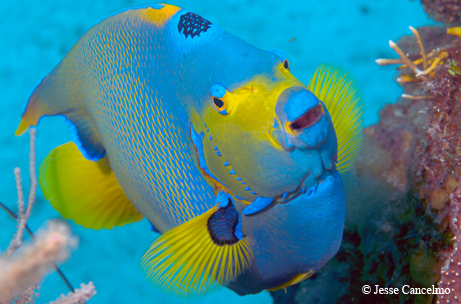 Queen angelfish on a reef near Cuba. “Together, we came up with six working themes for research and conservation efforts and collaboration,” Tunnell says. Those are coral reefs, sharks, sea turtles, marine mammals, fish resources and protected areas. The intent was to channel funding through the initiative to projects in those six areas. It hasn’t happened that way, but the initiative has been successful on other fronts. A number of those projects have obtained funding on their own, and now scientists in all three countries communicate more with one another about their work. Tunnell and other Harte staff and researchers from other institutions involved in the initiative have attended MarCuba, that country’s tri-annual conference on marine studies, as an opportunity to make connections. The 2013 Texas meeting attracted the largest delegation of Cuban scientists to visit the U.S. in more than 20 years. In addition to updating one another on the original six priority areas, delegates discussed expanding shark research and conservation efforts to include rays — a similar species experiencing many of the same issues — and adding research on the invasive lionfish epidemic to the fisheries group. The interconnection of the Gulf and Caribbean means that the entire Gulf, including Texas, benefits from Cuba’s remarkably pristine marine environment. Its waters remain much as they were in the 1960s, thanks to both external forces (primarily the longstanding U.S. trade embargo against Cuba) and internal ones, including Cuba’s small population, decades of little or no tourism development and pre-industrialized agricultural practices. A silky shark near the Flower Garden Banks off the Texas coast. The country also has strong environmental policies in place. Recent years have brought increased economic growth to Cuba, though, which could threaten that pristine environment if not done right. Scientists see the initiative as a valuable tool to help manage and protect the waters around Cuba and, by extension, the rest of the Gulf. One of the most robust of the initiative’s six research groups is focused on sharks. “The groups need a champion to lead them in order to take off,” Tunnell says, and the shark group has one in Robert Hueter from Mote Marine Laboratory in Florida and, more recently, Greg Stunz at the Harte Institute. Researchers hope that by collaborating on the study and management of sharks, they can ensure that these apex predators continue to serve their role in the greater ecosystem. 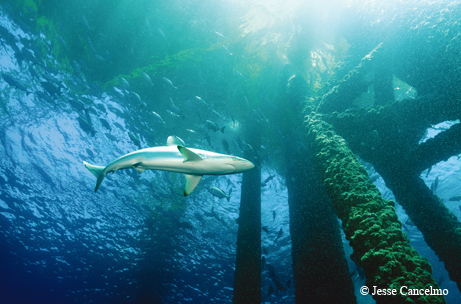 As top predators, sharks are critical to a healthy, robust marine ecosystem, Hueter says. Sharks directly control the density and behavior of their prey, which indirectly affects the next level of the food chain. Too few sharks leads to too many large reef fish preying on small reef fish, which feed on algae, so fewer of those fish means more algae. Eventually, algae can kill off the coral. Priorities outlined in the plan include studying how shark populations throughout the region are connected, what areas should be considered for special protection, how to reduce risks to priority species, and the effects of fishing and tourism on sharks and the socio-economic value of these industries. So far, the shark group has completed fishing surveys on Cuba’s northern coast, identifying possible oceanic whitetip nursery areas, and sampled for sharks off its southern coast, documenting apparent declines due to overfishing. Additional research cruises are planned to further explore the condition of shark populations, using the data to determine the distribution and abundance of sharks in the area. That knowledge will contribute to efforts to establish a sustainable shark fishery in Cuba and will help determine the location and size of additions to Cuba’s already-impressive network of marine protected areas. Given the migratory nature of many shark species, Hueter says, the goal is to develop a multinational, coordinated approach to management. Harriet Nash, who recently graduated from the Harte Institute, laid much of the groundwork for establishing a Gulf-wide network of marine protected areas. Fernando Bretos of the Washington, D.C.-based Ocean Foundation is leading work on sea turtles, species with strong Texas connections. Green, loggerhead, hawksbill, leatherback and Kemp’s ridley sea turtles spend various stages of their lives in different parts of the Gulf, some visiting all three countries during their lifespan. 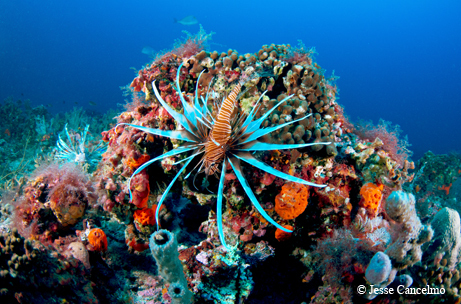 An invasive lionfish in the Gulf. At the Corpus Christi gathering, the sea turtle group participants decided to secure funding to focus monitoring efforts on three sites in Cuba on an ongoing basis and to expand monitoring to in-water feeding areas. The group hopes to expand tagging efforts in order to collect more data; the limited tagging of sea turtles in Cuba that scientists have conducted so far has already clearly demonstrated that the creatures move between Cuba and Mexico and most likely between Cuba and Florida. The group also hopes to expand and standardize efforts to educate key coastal communities in Cuba about the need to reduce poaching and bycatch, still major threats to Cuban turtle populations, and to continue and expand research on how climate change is affecting sea turtle populations. Working across international borders always presents challenges, but collaboration with Cuba is particularly difficult, given that the U.S. and Cuba have had no formal relations for the past 50 years. U.S. scientists traveling to Cuba to work faced restrictions from both the Cuban and U.S. governments, and U.S. regulations forbid scientists here from using government funds for any work related to the initiative. The two countries recently began the process of re-establishing relations, though, a historic move that has scientists excited about better collaboration. Bermuda chub swimming in a school. Change may be in the wind, but funding for the initiative must come from private foundations and individuals for the time being, and the U.S. embargo has yet to be lifted, meaning travel and logistics remain complicated. Cuba still struggles with limited infrastructure and resources as well, although Tunnell points out Cuba’s excellent scientists deal well with that. “It is inspiring to see the work they get done with so few resources,” he says. Obtaining permits and licenses required to conduct even the most basic research in Cuba continues to present challenges, as does the difficulty of sharing data and information between the U.S. and Cuba. “They just don’t have the bandwidth there, and they don’t have access to some things that are so simple for us,” such as data on websites, Tunnell explains. That situation likely will improve along with the relations between the two countries. Those participating in the Trinational Initiative are continuing to collaborate no matter what the pace or shape of political change. They next meet in Havana this November.